Do all Amish use the Slow Moving Vehicle triangle? 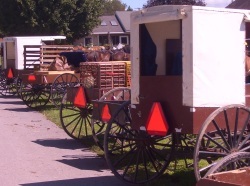 The black Amish buggy with the distinct bright orange triangle has become a symbol of the Amish. The slow moving vehicle triangle is an important part of road safety, but not one that all Amish accept. Why do Amish use the Slow Moving Vehicle (SMV) triangle? The reason for use of the Slow Moving Vehicle (SMV) triangle comes down to one thing: safety. Amish buggies travel at a very slow speed, typically around 5-10 mph. Traveling in a car at standard rural speed limits of 35-45 mph, a driver can come up very quickly on a buggy. 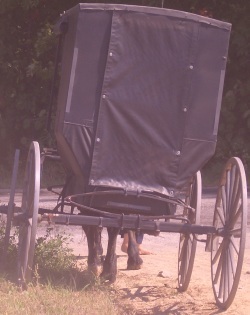 As Amish buggies are typically dark-colored, they can blend into background scenery. Thus the importance of the SMV triangle, and other attention-getting implements, such as reflective tape and blinker lights. Most Amish want to be as safe as possible when traveling by carriage, and see ensuring the safety of others on the road as their responsibility as well. Amish recognize that the triangle and other safety implements—including lights on bicycles and reflective tape and vests worn on the body when biking at dusk or in the evening—serve to keep them safe. Amish also realize that by not using safety lighting and reflectors, they are putting drivers on the road at risk, who might have to swerve at the last minute to avoid hitting a carriage. Amish have formed safety committees and have worked with highway departments in order to formulate safety standards and help ensure the safety of themselves and others. Concerned about road safety, Amish sought their own solutions in the 1950s. One buggy shop, for example, produced a sign with the words “Slow Moving Vehicle”. Amish also made use of reflective tape. Amish began using the SMV more widely in the 1960s and 1970s, as individual states began to encourage or require its use (Lee J. Zook, “Slow-moving Vehicles”). Despite the push for safety both internally and externally, not all Amish use the SMV triangle today. A small minority of Amish, in particular the Swartzentruber Amish affiliations, have staunchly refused to affix the safety triangle to their buggies. These conservative Amish groups have a few issues with the triangle. Swartzentruber objections stem from the ideas that the triangle is a man-made implement, and that the gaudy colors are not in keeping with their Plain lifestyle. Swartzentruber Amish also tend to exhibit a “what comes will come” attitude even more so than most Amish typically might. This often means putting faith that whatever God wills to happen, should happen, without man’s attempts to interfere. Higher-order Amish can be critical of this stance held by their more conservative cousins. Yet not all orthodox Amish groups refuse the SMV triangle. Another highly conservative group (often compared to Swartzentruber Amish), the Nebraska Amish, has accepted the use of SMV triangles. A few other groups have reached other compromises, such as the Amish at Ashland, Ohio, who use a less-gaudy grey triangle outlining a much smaller orange triangle within. The controversy over the Slow Moving Vehicle triangle has seen Amish end up in court as defendants. A number of cases have taken place, with conservative Amish preferring to be named in legal action than to back down. The highest-profile case was Minnesota vs. Hershberger, considered by the Supreme Court in 1990. Today most Swartzentruber Amish use grey reflective tape, typically a minimum of 72 inches, as well as one or two lanterns hung on the sides of the carriage when traveling at night. Swartzentruber Amish also often try to avoid traveling at night unless absolutely necessary. More progressive Amish, driving better-illuminated buggies, may continue to feel this is insufficient. Yet the Swartzentruber Amish have managed to reach this compromise with the state, and presently they comprise a small minority of conservative Amish who do not use the SMV triangle. However, the refusal by conservative Amish to use the SMV triangle has remained controversial, and further cases concerning buggy road safety have been heard in recent years. 3 responses to Do all Amish use the Slow Moving Vehicle triangle? I’m now reading “The Best Of The Amish Cook” by Elizabeth Colblentz (Editor:Kevin Williams) Vol. I…and on pg. 165 Elizabeth said clothes were washed by a motorless washing machine….can you explain…..seems like they do a lot of washing….and if they had to wash by hand on a washboard (yes I know what that is…..occasionally I have had to use one)LOL that would take forever and I don’t see how Elizabeth did all that she did in one day and that included washing, baking, house cleaning, working in garden etc……just curious…..
Also, do they dig their own water wells ? If they do then I have another question re: this….will wait for your answer…..
Just read all the pages on here re: your book “Success Made Simple” very interesting…..is this your only book out ? Sorry mispelled Coblentz…….it is COBLENTZ, not Colblentz as I previouslly stated…..sorry. On the first question, you might try this link: http://amishamerica.com/how-do-amish-women-wash-clothes/ (you’ll have to cut and paste it as my comments section doesn’t permit active links). And: Amish do dig water wells, in many if not most cases. On your last ?, I have a book along those lines planned..more info coming soon 😉 But there are some great books about Amish life in general, including the Riddle of Amish Culture by Donald Kraybill. There are a few shorter ones as well for a more general look at the Amish. Also, if you have a specific ? or topic, try the Amish Online Encyclopedia on this site (click link at menu bar at top). Hope that helps! Leave a reply to Do all Amish use the Slow Moving Vehicle triangle?